Abounding in creativity, color, Latin rhythms, and lyrics that convey their own special message of beauty, love, and caring for one another, Happy Land is Tierra Feliz, the debut bilingual album from native Guatemalan Mi Amigo Hamlet, is set for release on September 21, 2018. Mi Amigo Hamlet (Hamlet Meneses) writes and performs music in English and Spanish that he describes as “Bilingual Latin Alternative,” or, as his Grammy-winning producer Dean Jones calls it, “Juicy Bilingual Kids’ Alternative.” The sweetness of Hamlet’s voice and the gentle purity of his musical delivery speak to the heart in any language. Throughout Happy Land is Tierra Feliz, the musical impression is one of intensely colorful understatement. Over the past eighteen years, Mi Amigo Hamlet has taught hundreds of Chicago area children through his GoCreative Programs, an organization he founded to promote bilingual education for kids through art and music. Many of the songs on Happy Land is Tierra Feliz are the real foundations of this program, and Hamlet’s students get to know and love them from the moment they enter his classes. 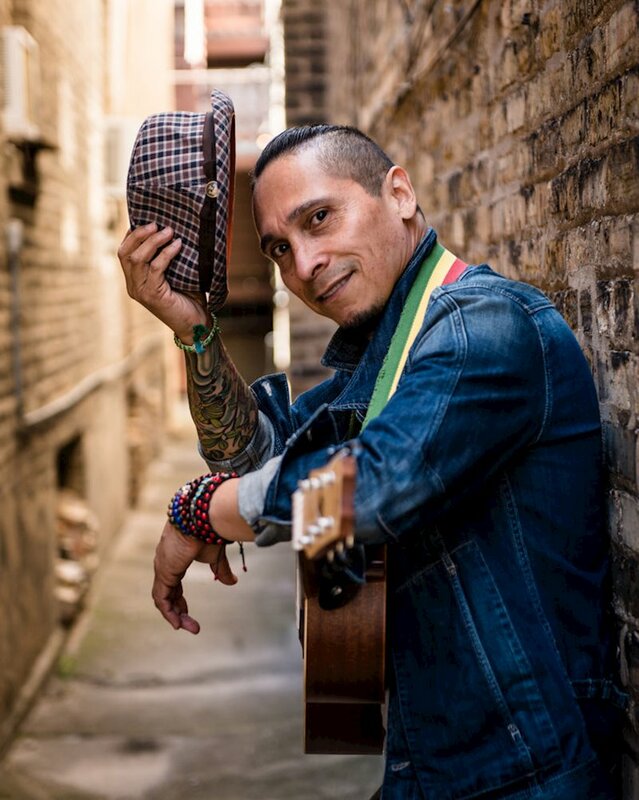 Dubbed “the children’s Manu Chao” by many of the families with whom he interacts, Mi Amigo Hamlet points to influences that include musician/activist Manu Chao, Catalan singer/songwriter Joan Manuel Serrat, and beloved Mexican children’s musician Cri-Cri (the late Francisco Gabilondo Soler). 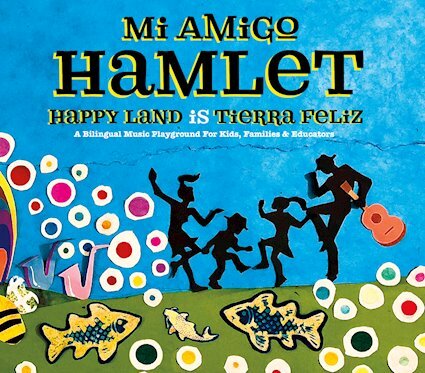 On Happy Land is Tierra Feliz, Mi Amigo Hamlet brings merengue, salsa, rumba flamenco, bossa nova, and more into the mix, while combining Spanish and English in very effective alternations that help expand young listeners’ second language skills. Several of the songs cover items like colors, modes of transportation, and months of the year, topics one would expect to encounter on a bilingual album, but Mi Amigo Hamlet manages to present these songs in a very personal way, from an unexpected frame of reference that surprises and delights. Hamlet Meneses was born and grew up in Guatemala and settled in Chicago in 1990. Endowed with an artistic spirit, he sang in choirs as a teen and young adult but did not begin formal guitar studies until 2005, when he entered Chicago’s famed Old Town School of Folk Music. There, he learned flamenco fundamentals with the school’s flamenco and dance accompanist, Mehran Jalili, and bossa nova with Paulinho Garcia. These styles have greatly influenced his music. He subsequently became a Hola Wiggleworms teacher at the Old Town School of Folk Music, and his musical contributions there continue to this day. Hamlet’s life has been marked by challenges. Raised by his grandmother, he grew up without parents, was hit by a car at the age of 11, became a gang member and lived on the streets of Guatemala City as a teen, and was the target of gunfire as early as age 16. Rescued from the streets by a Presbyterian church youth group, he completely turned his life around and went on to become a successful graphic designer, musician, and bilingual education visionary. The challenges did not stop, however, for the same year he arrived in Chicago, before he could even speak English, he broke his back while working out, was temporarily paralyzed from the waist down, and spent eight months in a wheelchair and walker while attending physical therapy to learn to walk again. Then at the age of 44 he was stricken with cancer, which later spread to his lungs. Hamlet survived all this, surmounting these obstacles with a strong determination to make the world a better place. In addition to his work with children in his GoCreative Programs, he recently founded the BeingBilingualRocks Foundation with the intent of bringing concerts to underserved communities. The change in the U.S. political dynamic after the November 2016 presidential election spurred Hamlet to move forward with even greater determination to be a positive advocate for kids and families, teaching love and acceptance through well-produced, flavorful, bilingual music, his GoCreative Programs, and the new BeingBilingualRocks Foundation.